ES Sets Up Major Double Bottom Ahead of the Fed. – Technical Traders Ltd.
ES Sets Up Major Double Bottom Ahead of the Fed. The downside price rotation in the US markets on Monday, December 17, set up a near-perfect double bottom formation near the 2530 price level and also prompted a dramatic price recovery after reaching these lows. Currently, the ES has rallied over 35 pts from this low level and will likely pause before the Fed minutes are announced on Wednesday, December 19. If the Fed holds true to their earlier promises of continued rate increases, we could see this 2530 level broken as price retreats from any relief rally and attempts to find lower support. If the Fed changes the context of their message and adopts a slower and more insightful rate policy, the markets are poised for one heck of a potential rally. 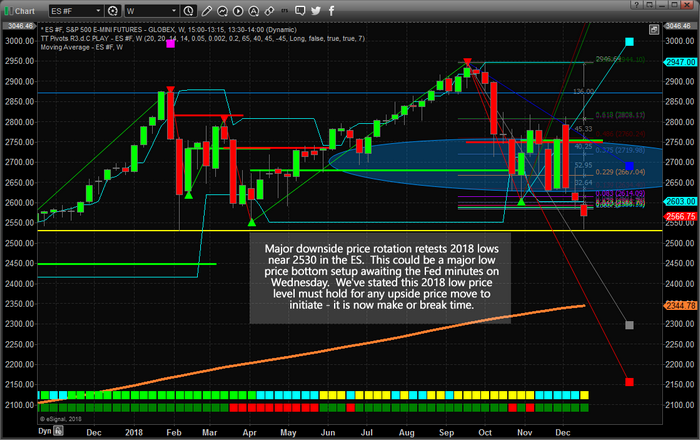 The ES if down by a little more than 400 points (-13.75%) from the peak in September 2018. We believe the markets have already priced in the expected Fed rate hike and we believe an additional rate hike could become a catalyst for a downside move towards 2300 if the 2530 level is breached. We would like to see the Fed pause, or even decrease rate levels by 25 bp, allowing the markets to parse through the credit/debt issues that have started to plague the global markets before it causes the markets to “turn turtle” and prompt a greater crisis event. Some of our earlier research, from 2013~2014, was a modeling system dedicated to the Fed interest rates, GDP, Population and Asset Valuations. We modeled various outcomes of the global economy over the future 15 to 20 years including massive debt increases, massive debt decreases, slowing GDP, growing GDP, massive changes in population and asset levels and many others. Overall, our research showed that the 2% Fed Funds Rate level should have been an upper boundary and should have been a near-term target back in 2015~2016. As or right now, the Fed should be decreasing rates to allow for a smooth transition through a “deleveraging process”. The Fed is behind the curve and is failing to properly navigate the future outcomes of global assets, debt and credit cycles. If the US Fed is not cautious over the next 12+ months with how they manage the FFR, they could push the entire global economy over a cliff faster than they can spell “Powell”. Everything rests on Wednesday, December 19 and the US Fed at this point. Our predictive modeling systems are still suggesting we should see strong upside price activity throughout the end of this year and early next year – assuming the Fed does not pull the floor out from under this market and capsize the global credit markets again. Learn how we can help you find and execute trades for better success. Our analysis has been well ahead of these market moves for months and we’ve nailed some incredible trades. Visit www.TheTechnicalTraders.com to learn more.